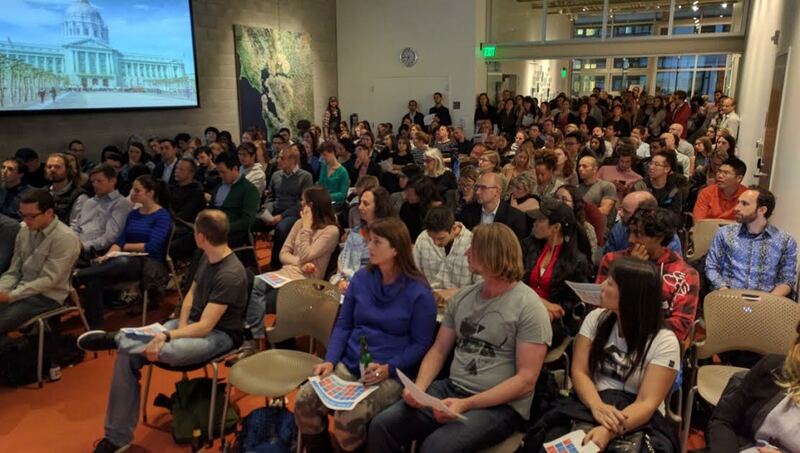 Yesterday evening, over 220 people squeezed into the San Francisco Bay Area Planning and Urban Research Association’s (SPUR) downtown S.F. location to hear the organization’s policy experts explain which ballot measures they are endorsing. 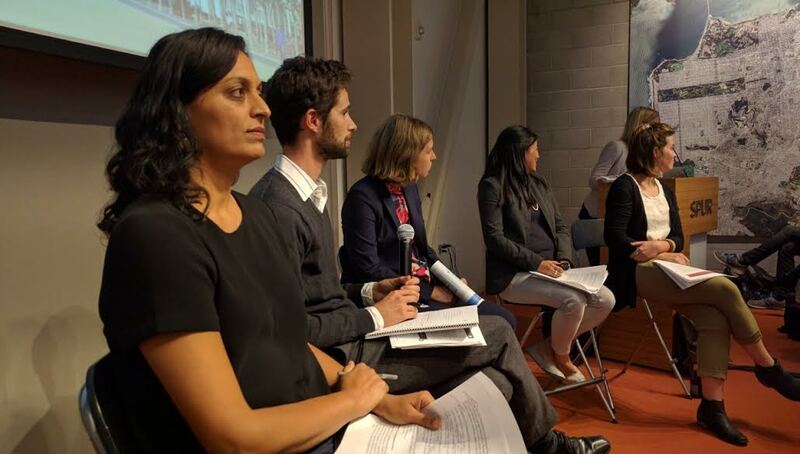 With 25 measures on the San Francisco ballot this November 8, each of the six SPUR experts spent just a few minutes on each decision–and it still took nearly two hours to get through them all. Thankfully, they also offered bottles of beer at the door. SPUR started with Measure RR, the $3.5 billion regional bond measure to update, repair and replace all of BART’s aging infrastructure. “Obviously, we say vote ‘yes'” said Ratna Amin, SPUR’s Transportation Policy Director. 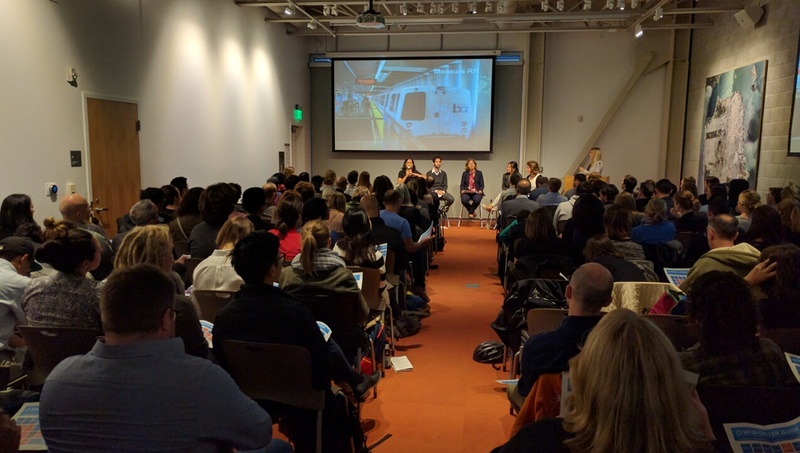 She spoke about the Washington D.C. Metro, which is about the same age as BART–and has suffered serious breakdowns as a result of deferred maintenance. “We don’t want to go down that road.” She praised the bond for offering some monies for studying a second set of BART tubes, which she described as “dreamy things.” Streetsblog, of course, agrees that RR should be a “yes,” and officially endorsed it earlier this week. This could be a tough one, as it’s a dedicated tax and therefore requires two-thirds of all votes in the three-county BART District (San Francisco, Alameda, and Contra Costa) to pass. Laura Tam, Sustainable Development Policy Director, discussed Proposition E, which transfers responsibility for maintaining street trees to the city. This measure pays for the costs through a $19 million set-aside from the general fund, adjusted annually. “Currently it’s inconsistent,” said Tam. “Seventy percent of trees are the responsibility of the [adjacent] property owner and thirty percent are maintained by the city.” But, she added, it’s often difficult to know which ones fall under which umbrella, which results in many trees dying because of lack of maintenance. “E recognizes that this is bad policy,” she said. The SPUR panel discusses ballot measures while the audience drinks brews. Photo: Streetsblog. 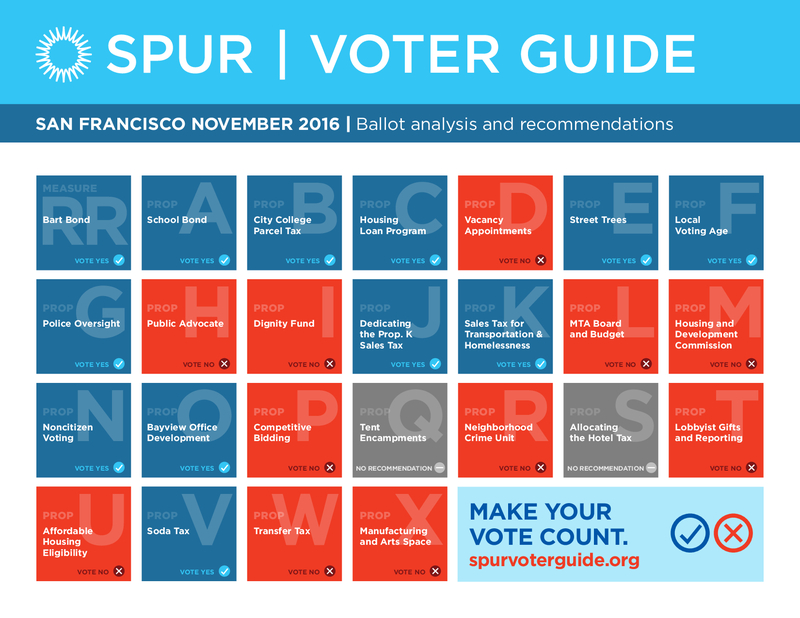 As to the rest of the ballot, SPUR also has the right idea–it’s best combined with beer. I’m voting against J and K, because K taxes merchants to make up for revenue lost from free Sunday parking and low vehicle registration fees. Funding transit is good, but don’t do it in a way which effectively subsidizes motor vehicle ownership and use. The revenue here exceeds that lost from Sunday parking, but nevertheless I want that back before other, more damaging revenue sources are pursued. The irony is the free Sunday parking is claimed to support merchants (which it does not due to reduced parking turn-over) but a higher sales tax indisputably hurts them. The interesting thing about J, to me, is the way the Supes are lined up on it. The two most left-wing Supes (Campos and Avalos) support it but so do the two most right-wing Supes (Farrell and Tang). But at least it’s not a bond measure – it doesn’t raise taxes although it does re-allocate funds. K is another whole ball of wax because it is a huge increase in a regressive tax – sales tax. One can argue that a sales tax is fairer because it is the most broad-based and because it is relatively easy to avoid. But my general rule is to always vote against tax increases except for police and prison bonds. Thanks for covering this, Roger! Hopefully no one drove themselves home after the meeting. Don’t know, but I took Muni. Amin is a total moron. As director, she should be a serious advocate for substantial near and long terms transit solutions, including a much-needed second BART tube. Her view of a tube as “dreamy things” only proves my point that she is just talk (like SPUR in general), not action. She is part of the transportation problem in the Bay Area. RR is a flat out No. No on J and K as well. MUNI will hike fares again next September, regardless. Want to fix the escalator problem? Build canopies. Increase corporate taxes, not the sales tax. Those tech firms driving up the cost of living need to pay more for the luxury of having a SF address. They should also be taxed to improve our transit infrastructure. You don’t think the BOS hasn’t already looked at increasing corporate taxes among other taxes including transportation? It’s up to the majority of voters to tell them no, but it won’t happen since SF is a liberal city. Raising corporate taxes simply drives up the cost of the products and services that they sell, just like sales tax does. There is no way around that – corporations ultimately pass all extra costs onto either their customers, their employee or their shareholders (i.e. your IRA or 401K). Corporations cannot ultimately pay tax – only people can. In fact SF had to reduce taxes on Twitter etc to stop them moving to nearby cities with more tax-friendly rules. True but that is why the State laws are so important – they restrain the city’s ability to tax gouge. Not just Prop 13 although can you imagine how much our property taxes would go up if they could? But the State also stops the city imposing local income taxes, CGT and estate taxes, and limits their ability to raise sales and road taxes. Yes on death penalty and a thinly veiled attempt to get grocers to oppose the ban on plastic bags? Get outta here. I would not expect any two people to agree on absolutely everything.